The Bruery is rather prolific when it comes to creating new and unique ales. I recently enjoyed a Rueuze, it is an excellent sour, and by far the best Bruery beer I have purchased off the shelf. Yesterday I decided to crack open my Bois. The inceptive whiff as my nose reached the glass was amazing. The color was rich dark oak, oak and bourbon meet the palate and so much more. This is one of the finest ales I have ever enjoyed. It posses that aged character, like Monster 29, Manny's Mead, or the homebrew Victor gave me. A big high gravity well aged heaven. Its near kinship with Utopias was evident. I did a quick side by side, next to Utopias it's a bit fruitier. This is by no means a fruity ale, until it's put in that context. It is the perfect combination of dark fruits, oak, vanilla - it just has that richness - sweetness, that only comes with aged sugars. 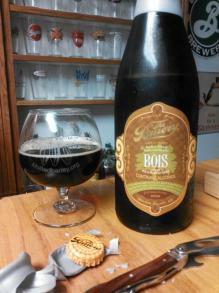 While it is true that there is a lot of hype surrounding Bruery beers, the societies, this one lives up to the hype. Aptly named, it has a definitive woodiness, oakiness. So damn good. This is one of those ales you miss when it's gone. 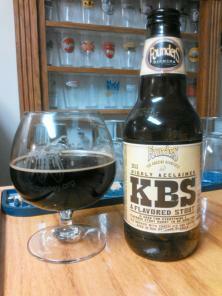 It has been a while since I last reviewed a KBS, 2011 to be exact. For the past two years it has been pretty good, prior to that I think it may have taken a bit of a dip for a year or two. I was excited to try this years. I have heard that on tap last year, and this year, that it was a little off. However last years bottle was good, and that would be what I would be sampling from this year as well. Moving to Georgia meant loosing years of beer buying status with my local beer guy. I had hoped that I had established a good enough relationship with Vince at Habersham to at least snag one four-pack. But two bottles it was. Hopefully my buddies back in Michigan will be able to hook me up with another bottle or two for the cellar. On to the ale. Little has changed with the appearance, it still possesses a luminance robbing deep rich brown occupancy in the glass and a beautiful fading head. The nose is distinctly complex, with vanilla, chocolate, and coffee most prominent. Overall the aroma is the best aspect of this years KBS, it's world class. The flavor is excellent - but has a slight tannin bite I initially. Overall I think it has a bit less barrel influence than years past but it's hard to say without a side by side of last years, which technically is impossible as has it has already changed as a result of being cellared for a year. KBS never did have the bourbon barrel influence that BCBS has. Still an excellent product, but perhaps not as ecstasy inducing as the past two years.